Levine sets antebellum Southern society firmly on the shoulders of slavery. His spokespeople, many of them elite Southern women, describe a system they deemed benevolent, permanent, ordained by God, and sustained by economic necessity. 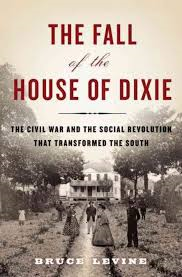 But the social and political fissures that brought down the House of Dixie, Levine argues, existed throughout the antebellum years because they were part and parcel of the region's economy and culture. Southern elites failed to understand the indomitable spirit of their slaves, determined to achieve freedom for themselves. As the war dragged on, white supremacy and a rigid caste system led non-slave holding and poor whites to question why they were fighting to sustain a planter aristocracy of privilege and pride. And the doctrine of states rights insured that the parochial interests of the individual states regularly trumped the collective needs of the Confederate nation. The evolution of Union war policy also contributed to Dixie's fall. Levine traces Lincoln's conservative social and military war aims that evolved into a revolutionary policy to liberate and emancipate America's slaves The Emancipation Proclamation, issued as a war measure, allowed former slaves and free blacks to fight in the Union Army. Northern soldiers would now carry the promise of freedom and citizenship in their knapsacks. Many Northerners also changed their understanding of the war, believing that only by destroying slavery could a new, more perfect, Union be created and preserved.